The Scaling Converter Series of products includes these "Swiss Army Knife" converters, an all-in-one solution to your SDI and HDMI needs. 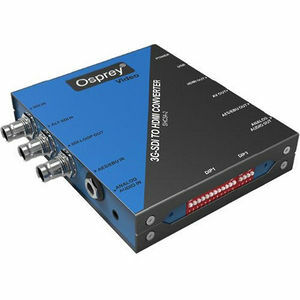 Supporting conversion from SDI to HDMI (SHCSA-2) or HDMI to SDI (HSCSA-2) as well as Scaling, Audio, and Color Space options, these unique tools also feature Video Frame Rate Conversion and Up / Down Scaling Options. AES/EBU and Analog Audio can be embedded into the workflow or de-embedded for external monitoring. Multiple video output options enable confidence monitoring of the workflow. The settings can be changed by manual dip switches as well as a USB interface. Up to four custom settings can be configured with the software and are accessible via either interface. Diagnostic data overlay can be enabled to monitor video information.